Many ecommerce merchants use Twitter to connect with customers, build personal relationships, and influence conversations to meet business objectives. Merchants can learn what customers have to say about their brands and products, provide proactive customer service, and create promotional campaigns that drive sales. Successful use of Twitter requires that merchants understand how to leverage the platform to create the most response. Use these 25 tips to get started. Your username (@username) is your Twitter URL. If the account is associated with your company, try using your business name or a variation of it. Twitter allows up to 15 characters for usernames. Your profile consists of a bio, avatar, and background images. It should tell the story of your brand in a single glance, so select those elements that best visually represent you. Write a clear, concise bio — a description of your company in 160 characters or less — that describes your brand, products and services, and includes a trackable link to your website or a specific landing page. Your business’s logo can function as an avatar. Choose colors and images that are consistent with your website and branding. Here are two profiles that fit these guidelines: Etsy.com (the online marketplace) and Bass Pro Shops (the retailer of outdoor gear). 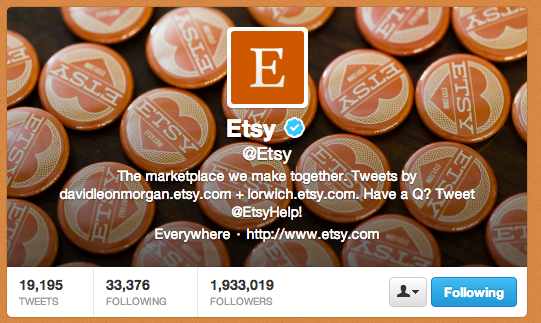 Etsy uses creative imagery and its website color scheme in its Twitter profile. 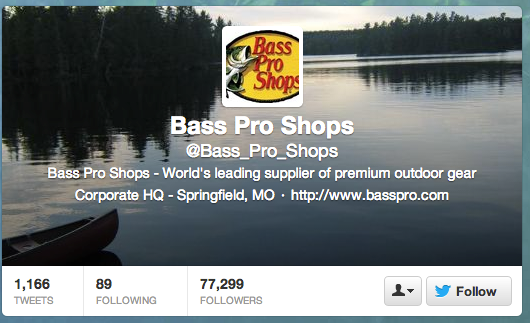 Bass Pro Shops’ profile emphasizes fishing, its core business. Listen first and tweet later is a good motto for using Twitter in an ecommerce context. Use Twitter advanced search or tools like HootSuite or Sprout Social to look for tweets that include your company name, products or services you offer, as well as tweets about your competitors and business category. Then, respond when it’s appropriate. Follow and observe other merchants in your industry to see what they’re doing well. Don’t be too formal in your posts. Write a tweet like you’re having a conversation with someone. Write in the first person and strive to craft a genuine, approachable style. Tweets should reflect the personality of your business. The use of humor is a common practice; inject funny anecdotes from time to time if they are a good fit. Though your voice shouldn’t change, the tone you use can adapt to a given situation. For example, if someone complains about your customer service, your tone should be more reassuring and respectful. If someone compliments a product you offer, then a more jovial, congratulatory tone is in order. Reply to tweets about your business, whether they are positive or negative. You can favorite and retweet positive messages, thank those who praise you and address critical tweets in a helpful manner. Use influence measurement tools like Klout to qualify the influence of your followers, and then engage with those who have a greater degree of authority. Even though much of your interaction may take place in near real-time — responding to a customer’s question, for example — it’s best to approach the use of Twitter in a strategic manner. Create a content calendar and schedule several consistent tweets over the course of a few days or weeks. Set aside certain days for particular types of tweets. For example, Monday could be for special promotions, Tuesday for behind-the-scenes photos, Wednesday for how-to tips, Thursday could focus on trending topics, and Friday to spotlight the people in your company. People appreciate information that solves a problem or answers a question. They also respond to tweets that inspire and entertain, so include both types in your content plan. Make your tweets purposeful and keep the interests and needs of followers in mind. If your business gets talked about in the media, share a link to it on Twitter. Share content on Twitter that your followers won’t find elsewhere. This could include exclusive offers, behind the scenes photos, employee profiles, or new product releases. According to Compete.com, 94 percent of people named “discounts and promos” as their top reason for following brands on Twitter. Give your followers discounts and deals they can’t get elsewhere. Twitter states that posts with links, pictures, and videos get retweeted more than those that contain only text, and tweets with photos get twice the response of those that don’t. Regarding use of video, Twitter recently acquired Vine, an iOS app that lets you shoot 6-second videos that loop. Some retailers are beginning to experiment with it — here’s an article on CMO.com, for example — as a fun way to introduce products. Also, Twitter is fully integrated with video hosting sites like YouTube and Vimeo. There is no magic number for how often you should tweet. Once per day is a good place to start, and then you can test different posting frequencies to see what works best for your business in terms of response. Passing along someone else’s tweet to your followers is a good way to build social capital and increase credibility. This can often result in other people retweeting your content. Also, mention others in your tweets by including their @usernames. Positive tweets that contain relevant, personalized content can establish goodwill. A direct message — DM — is a way Twitter users can communicate privately with each other. You may wish to use direct messages in cases where there is too much back and forth between you and a customer or when exchanges become too specific. Ask the follower to send you a direct message with contact information so you can respond by email or phone. Note that you can send and receive DMs only from your followers, and vice-versa. Use the “Favorite tweet” option to spotlight tweets from users who complement your brand or products. Even though Twitter has a 140-character limit, a 2012 Salesforce report stated that tweets shorter than 100 characters get a 17 percent higher engagement rate. It’s also a good idea to leave some space — 20 characters is good — for others who wish to retweet your post to add content. Following others based on interest is a way to discover relevant content and inspire ideas for your own tweets. Twitter provides merchants with the ability to communicate with others that have similar interests. Instead of focusing solely on your products and services, create content that taps into the passions of your audience. Twitter has two advertising options suited to small business budgets: Promoted Accounts and Promoted Tweets. Using these can get your posts seen by more people. Ask your customers if they are following you on Twitter and what they think about your tweets. Find out if there’s anything you can do differently to improve their experience or make it more valuable. Conversions. How many users sign up for your service or buy your product. Twitter’s always-on nature makes it possible to participate in conversations as they occur. Social media is constant and you can’t always know when sales opportunities may arise. Just be prepared for them when they do. Using these 25 tips can help improve the quality of your Twitter engagement in ways that support your business marketing goals and objectives. For more information, Twitter offers two resources for smaller businesses. Twitter for smaller businesses. An informational site focused on the needs of small business users.